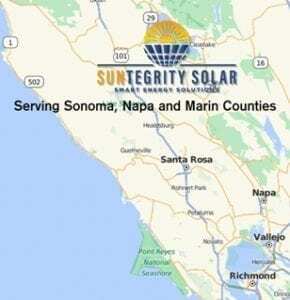 Locally owned and operated, Suntegrity Solar proudly serves Sonoma County, Napa County and Marin County. Our business is owned by the father and son team of Paul and Keith Kruetzfeldt. As a construction company dating back to 1977, and we have focused exclusively on solar since 2009. Since then, we have installed over 600 solar systems. We are Enphase Premium Installers, LG Pro Installers, Certified Tesla Installers, and Authorized Sunpower Installers. Paul Kruetzfeldt has a Master’s Degree in Electrical Engineering from UCLA. Paul established Kruetzfeldt Construction Company, Inc, in 1977. Since that time, he built many high-end custom homes and commercial projects throughout California. He has also travelled the world to install radomes to protect radar systems in remote locations like Antarctica. Unlike many construction companies, Paul has ensured that Kruetzfeldt Construction Company has always developed the skills in-house to handle all aspects of their projects. Subsequently, his team developed a broad base of experience. Paul resides in Santa Rosa, and enjoys remodeling his home whenever he gets the time. Paul has solar PV and thermal on his own home. He can be reached at paul@suntegritysolar.com. Keith Kruetzfeldt has a Master’s degree in Mechanical Engineering from UC Davis. While at UCD, Keith assisted development of Hybrid Electric Vehicles and worked closely with Dr. Frank, one of the pioneers of the Plug-In Hybrid (the basis for the Volt). After graduating, Keith supported the production of Light Emitting Diodes (LEDs), another green technology that has blossomed similar to solar. He is a former Engineering Manager with Hewlett Packard and Agilent Technologies. While at Agilent, Keith led an organization within the Precision Machining Technology Center at Santa Rosa. Solid 5-star reviews from satisfied customers. Over 600 installations throughout Sonoma, Napa, Marin and Lake Counties. We don’t try and sell solar if it doesn’t make sense. Accredited members of the Better Business Bureau with an A+ rating. Listed in good standing with the CA Contractor State License Board for over 35 years. Contractor licenses include class B (General), C-46 (Solar Electric & Thermal), and C-10 (Electrical). All installations done with our own crews.